For all of you who’ve said, “I can’t draw a stick figure!” Or, “I can’t paint anything.” Well, I’ve finally gotten started designing my PIY (paint-it-yourself) kits. Whether you can draw or not, haven’t taken art class since high school (if at all), I invite you to give it a whirl. I think you’ll surprise yourself. I’ve posted pictures today of my little St. Patrick’s Derby & Shamrock. Hopefully you can see from the pics just how easy it is. If you can color within lines, you can do this. The best part? It’s free! Here’s the link with the full supply list and instructions. If you have any questions or comments, feel free to email me. I painted this on watercolor paper, but you could do it on canvas too. Then you’ll need some craft paints, brushes & that’s about it! As a side note, I did the “Kiss Me!” in Photoshop, but you could use a paint pen if you don’t have a photo editing program. I hope you give this a try. And please, Please, give me your feedback – good or bad. I also have Easter bunnies, Spring flowers & lots more coming! Happy St. Patrick’s Day, just a little early. I’m hosting a giveaway @ My blog! Stop by and check it out!! That’s cute! My kids would love it if I decorated for St. Patricks Day! Love that! Stop by my painting blog and say hello! I’m not good at murals… but can paint about anything else! I missed this one yesterday – so glad I still found it. I’m really enjoying your step-by-step help. You make it look easy! That’s fabulous! Thanks for sharing how to do this for people like me! :)The possibilities are endless. Thanks for linking with this great post! 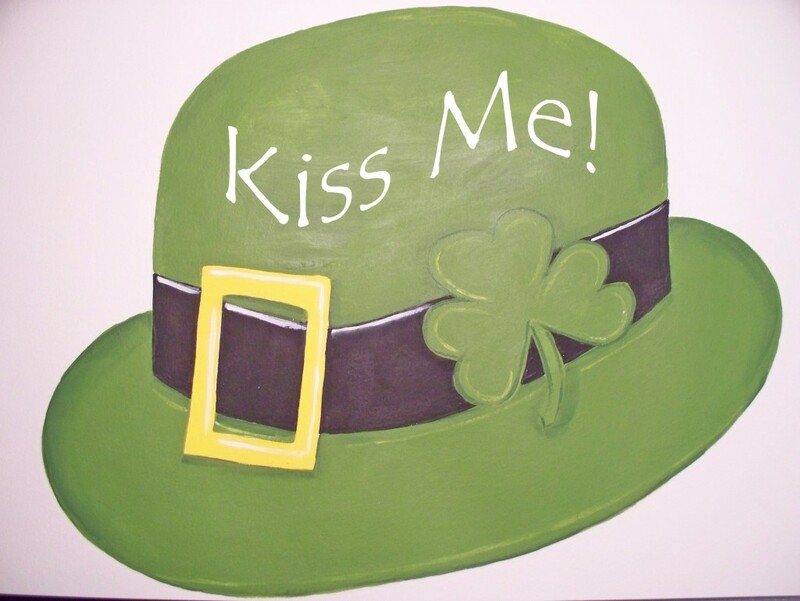 I am having a St Patty’s link up next week and would love for you to link this up-I know it will be a big hit! Thanks for joining Get Your Craft on Thurs. Please join me next week for another great party! PIY, what a great idea! Your hat is totally cute! Totally cute hat!! I haven’t forgotten the fairies I wanted to speak to you about. My teething little one has just made my life very uncreative for a little while! Hence I’m catching up on blogs after midnight!